We make temperature sensors and related equipment to the food, beverage and catering industries. We supply the full scope of the food industry from agriculture, to food processing, to catering. We are able to produce food grade temperature measurement equipment suitable for use in hygienic environments. We can supply standard replacements for broken sensors but can often improve on sensor designs and life. We can also help you design new and novel temperature sensors for new projects. There are various areas of agriculture we supply, from fertiliser manufacture and grain bin temperature measurement. We can make a temperature sensor whatever your process and have developed specialist sensors such as compost temperature sensors. From independent microbreweries to the UK’s biggest food brands, we solve food manufacturers temperature measurement problems. Accurate temperature measurement is critical to energy and process efficiency and correctly measured temperature minimises waste. 1Pt100B sensors are post common in food manufacturing because of the temperature range they can measure, sometimes thermocouple type J or K are used as well. 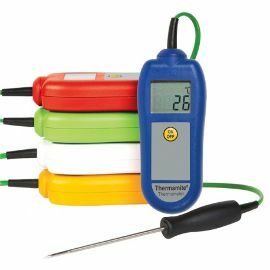 Resistance thermometers and thermocouples can be designed to be “food grade” meaning among other things they are crevice free and waterproof to reduce bacterial growth and make cleaning easier. Contact us with your requirements if you have an existing food sensor design or are unsure what you need we’ll be able to find you get the right sensor for your process. Dataloggers for monitoring refrigerated transport or chilled cabinets. We can help you maintain an accurate HACCAP system to keep your food safe. Thermometer kits can be supplied with record logs and probe wipes for HACCP compliance. Some hand-held readouts and temperature sensors are available to buy online.